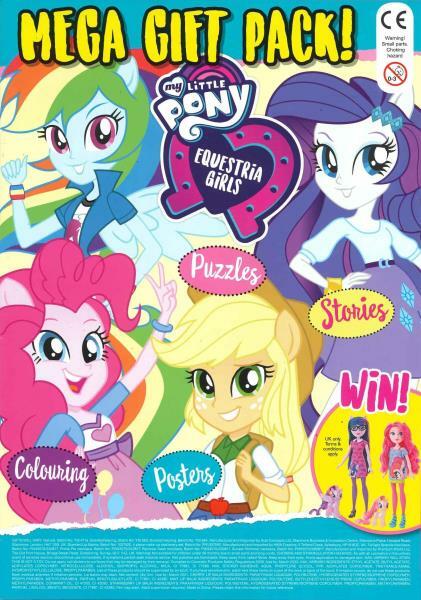 A Brand new magazine from the popular My Little Pony. Buy a single copy or subscription to My Little Pony Equestria Girls magazine. Explore this new world with Twilight Sparkle and her friends through the pages of this magazine. Fans can truly immersive themselves within the experience featuring the core cast of Canterlot High in another world of adventure, friendship and style. Each magazine features example gifts such as hair extensions, lip balm, nail stickers and sample story books to make your little girl happy. This follows a brand new expansion of the My Little Pony toy line that follows pony Twilight Sparkle seeking adventures within an alternative human world. She not only has to learn to act like a human, but works with her pony counterparts.